We have been providing the best entertainment to shoppers for over 13 years on eBay, Amazon, Bonanza, Alibris, and various other marketplaces online. 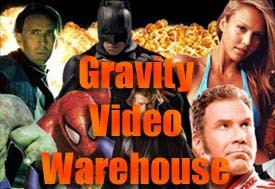 We currently have thousands of movies in stock, ready to ship, so if you don't see something you want just email us at sales@gravityvideowarehouse.com. We may have just what you are looking for! Last Updated: Jun 1, 2018 Listing Expires: Sat Jun 1 19:47:31 2019 This listing has been viewed 3606 times.